designed to be handled by auxiliary shore cranes or the ship’s gear. In many cases, several units can be applied to the customer’s operation and will not exceed the initial investment of one single larger stationary tower unit. En-masse conveyors are an extremely efficient form of high volume material handling. 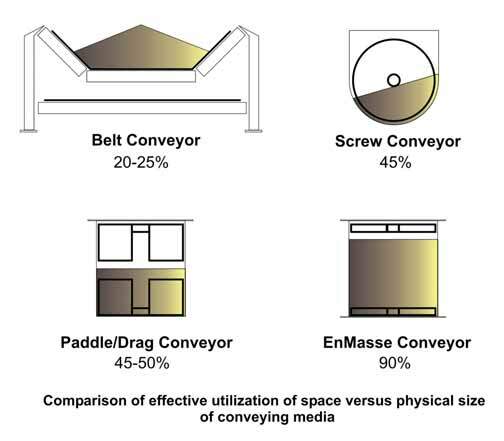 This is why CDM Systems uses the en-masse principle in both its conveyors and marine leg unloaders. Where other technologies have failure points due to misalignment, carry- over, and other material transfer challenges, the en- masse technology is reliable, efficient, and requires little maintenance. In horizontal applications the en-masse chain conveyor can handle up to 90% of the cross sectional area, resulting in a smaller piece of equipment to handle the same or greater capacities over other conveying technology. These chain conveyors also provide very efficient horsepower consumption keeping operating costs low. The en-masse conveyor is often known as the en-masse chain or drag conveyor, although very different in principle from a standard drag conveyor. CDM Systems offers a wide range of horizontal, inclined, vertical, or combinations of both in its totally enclosed conveying systems. optional self-metering style inlets that prevent flooding of the en-masse conveyor. CDM Systems’ material handling experience allows it to provide its customers with multiple style conveyors that include its normal single strand units, double strand, twins, or multiple strands for extreme widths. These conveyors have the ability to convey on the conventional bottom, top, or combination of both simultaneously.